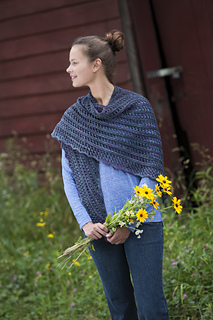 The inspiration for this shawl comes from the beautiful colors in this yarn - the moody winter-sky mix of blues and purples match the shades of the Iolite gemstone. According to folklore, the gem’s violet and blue carry the spirit of journey, of dreams and intuition, of exploration and illumination. 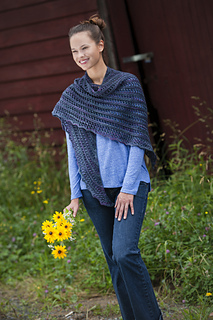 This shawl combines modern lines with simple textures and yarn overs creating unique surface interest on both sides of the shawl. 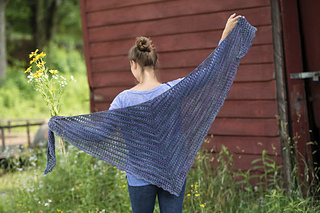 Iolite is knitted simply in one piece, starting at the center of the top edge without the need for a garter tab, and it is shaped into a practical elongated triangle using double increases at the center and along both edges. 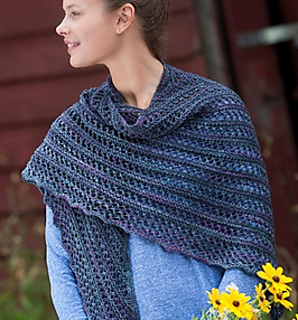 Iolite is a fun and easy one-skein project, perfect for quick last-minute gift knitting. Miss Babs Yowza (100% Superwash Merino Wool; 560 yards/512 meters/8 ounces/227 grams), 1 skein, Shown in color Iolite. Or approximately 530 yards/485 meters in light worsted weight yarn. Blocked: 31”/79 cm deep at center and 86”/218 cm long wingspan Unblocked: 21”/53 cm deep at center and 58”/147 cm long wingspan. US 8 5.00 mm circular needle, 32” or longer. 20 Stitches and 32 Rows = 4”/10 cm in garter stitch, unblocked. Note: Correct gauge is not critical for this project, but your final measurements and yardage requirements may vary if your gauge is different.